Best way to keep a horse from escaping? My friend and I found some horses on my server and I'm wondering what the best way would be to keep them from escaping. At first we just had them in an open area with leads attached to posts. One day I was on by myself exploring, and when I came back, both leads were broken laying on the ground. The horses were still nearby, so I was able to pick up the leads and attach them to the posts again. Since then we partially walled off the area. Enough that we figured they wouldn't get out if it happened again. Well we were both out exploring this time, came back, and his horse was gone. I found it wandering in the field outside of the wall. We still don't really know how it got so far in such a short amount of time. Or how it got there at all, really. 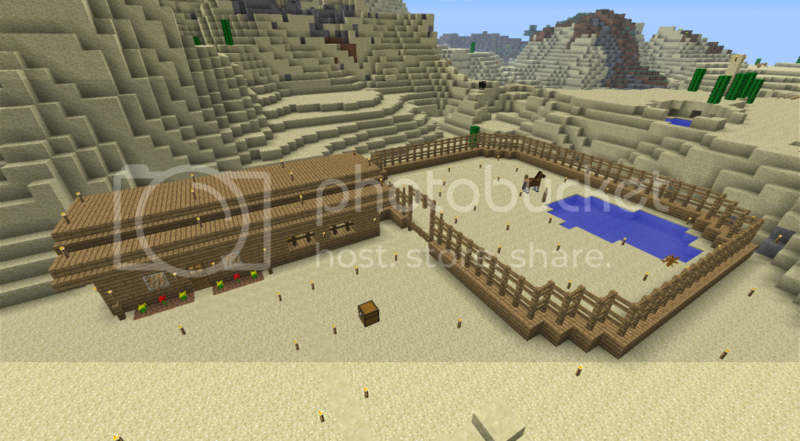 So now I'm in the process of making a ranch with a gated area of 1 block of wood and 2 fence posts high. My friend is still paranoid of his horse getting away, so he put it inside the ranch -with- the horse tied off to a post. So should this keep them in ok (see picture), or should they still be tied off, too? Is the leads breaking the way they are a bug? It only seems to happen when we go far enough that the area has to load back in when we come back. Thanks in advance for any info. Also....sorry for rambling so much lol. Thanks for the quick replies. I guess I'll keep crossing my fingers until 1.6.2 comes out. Which should be today, hopefully. That should be more than enough to keep them in. I built them a barn. So I updated my client and server to 1.6.2...Walked away a fair bit, walked back...Horses lead was broken again. Make a hole two blocks deep and one block across. That's the minimum size for the hole. Now nudge the horse into the hole. A pen is really all you need. When it comes to glitching, there is really not much you can do but wait for a patch to come out. Try making a two stage gate, so that they can't escape when you come in. Yeah, I'm thinking the leads are pretty pointless either way unless I'm just stopping and slapping down a post temporarily. Anytime I walk too far away then come back, the leads are broken and their wandering around. The pen I have at the ranch seems to be working fine so I'm glad for that. The horse coming off of the leash has happened to me several times. supposedly 1.6.2 has the bug fix for this. I just downloaded 1.6.2 and it still happens. I've made my fence 2 high. and that helps with containment. Hopefully they patch things up a bit. I found a vilage being raided by mobs during a thunderstorm and while i was fighting them i went back for my horse and he was gone.... where did he go was he struck by lightning did mobs kill him or is there something i dont know about horses and storms? Not sure where people were getting that leads would be fixed in 1.6.2.... However, animals glitching out of fenced areas was supposedly fixed in 1.6.2 according to the bug list for it. Encase them in several layers of obsidian. I know for a fact horses never have diamond tools. I have the same problem with leads breaking in 1.6.4, and I even stand next to the horse. I'm standing next to it, have a lead in hand, tie it to a post. Few seconds, the lead breaks and the horse wanders off. I'm getting ed. I can confirm that the bug hasn't been fixed in 1.7.5. I doubt they have it fixed in 1.7.9, and I would be surprised if they fixed it in 1.8. If you are going to be away from your horse for an extended period, have it in a corral. I have yet to see a horse get away from a properly fenced in area. You corral is fine, just put another line of fence gates across the top and they wont be able to get out. Barn/fenced in area, both work just make them at least 3 blocks high. <Click me! It only takes a few seconds! 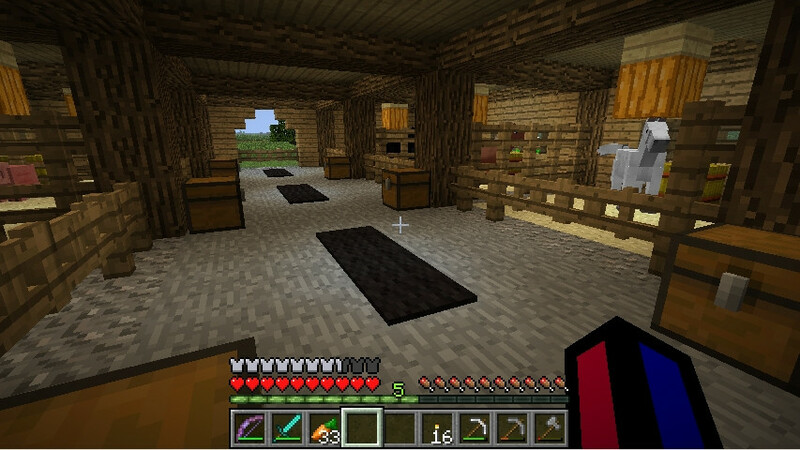 I play 1.7.9 and all I did was just built a ranch like yours, but smaller. There's only 2 horses in there and I don't have any leads, but they won't escape. When I have time I'll probably build a barn as well but for the time being, your little ranch should be fine. I'm pretty sure I can place about 3 - 4 horses in there so for your ranch, I think you can place 5 and they probably won't escape. Also, a barn next to the ranch is a pretty good idea, but for now, you can just stick with the ranch, since it'll take some time to build a barn. IF you do have time to build the barn, you can get a few more horses (and pigs if that's your style) and just let them out into the ranch once or twice in a while It's just nice. I think they might die if they don't, but I don't think they even eat so that doesn't matter. I just do it anyways (I have nothing else to do. I play on peaceful, turn it on Normal in the middle of the night, then kill in the morning, and turn to peaceful again). 2. Build a barn (minimum 1, maximum depends on animals) next to the pen/ranch. 3. If you have sheep but have no grass in your pen, just put your animals in their pens and replace the sheep's floor with dirt, and the pen's ground with dirt, too. Grass will grow in time.